Line the side and base of the cake tins with baking parchment or greaseproof paper. Place the sugar in a mixing bowl, pour in the vegetable oil and beat together till thoroughly mixed in. Break eggs into a measuring jug and lightly beat together with a fork. Pour eggs slowly into mixture and beat well. Sift the flour into a bowl and add the bicarbonate of soda and mixed spice or cinnamon. Using a spatula, gently fold in half the bowl of flour mixture and half the carrots till just combined and no more. Add remaining flour and carrots and gently fold in till just mixed in. Fold in the pecan nuts. Divide mixture equally between the two cake tins and smooth out till level with a cranked handle spatula. Place both cake tins in the oven, one on each shelf. Bake for approximately 40 – 50 minutes depending on your oven. Do not open the oven before this time. To check if baked properly, push a thin skewer or cocktail stick into the centre of each cake. If the skewer is clean when removed, the cake is baked. Leave the cakes in their tins to cool down for approximately 30 minutes. Remove the cakes from the tins and place on a wire cooling tray till cold. Wrap in cling film and place in the fridge for up to 24 hours till ready to use. Layer with a filling of your choice. We like lemon buttercream or a naughty cream cheese filling! 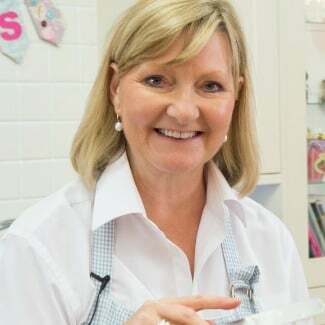 This week special guest baking tutor Mrs Jones – Passion in the Baking teaches how to make a gorgeous Carrot cake that tastes delicious! Mrs Jones mentions that the quantities make two 8? round cakes, but they are shallow cakes. Need to bake a different size? Use our Cake Recipe Re-Calculator, find the Banana recipe then select your new bake size.